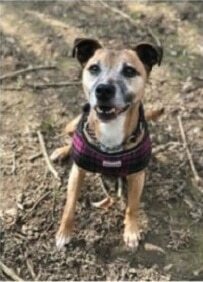 Bilbo is a 10-year-old small/medium crossbreed boy who finds himself at Foal Farm Animal Rescue, Biggin Hill, Kent, because of a severe change of circumstances at his former home. 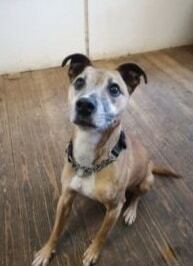 Poor Bilbo has come from a very stressed home and he is feeling very stressed in kennels. 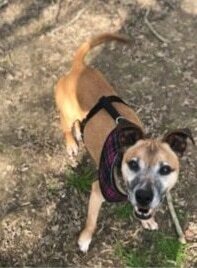 Bilbo is friendly with people and is a delight to have around, but he needs a responsible home as he doesn’t like other animals. He is happy to be muzzled and will enjoy pavement walks or just garden exercise with extra stimulation if you have a nice big garden. He is absolutely fine out and about and is an easy walk. At Foal Farm he loves the enrichment sessions and looking for treats, as well as playing tennis ball. Bilbo is neutered. He has an irritable bowel, not helped by the stress of being in kennels. Poor Bilbo really deserves a break. Could you save him from kennels, ASAP? Foal Farm usually rehome within their locality, but they will consider suitable homes further away. Please mention that you saw Bilbo on the Oldies Club website.